A yummy high protein vanilla and chocolate cheesecake nestled inside a cookies and cream quest bar. 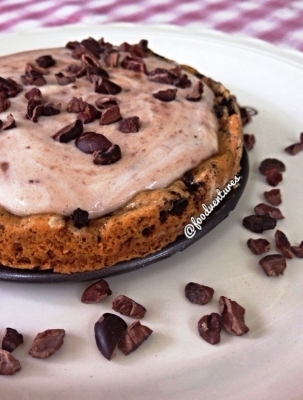 microwave your quest bar for 10 seconds then mold into a pie shape. Bake at 350 for 8 minutes. While baking, combine your yogurt and sweetener and mix well. Once your quest is done baking, spoon your yogurt mixture into the quest. Let sit in the fridge for a few hours. combine your protein powder with a little almond milk until creamy then spoon on top of your greek yogurt. Top with cacao nibs. Enjoy.